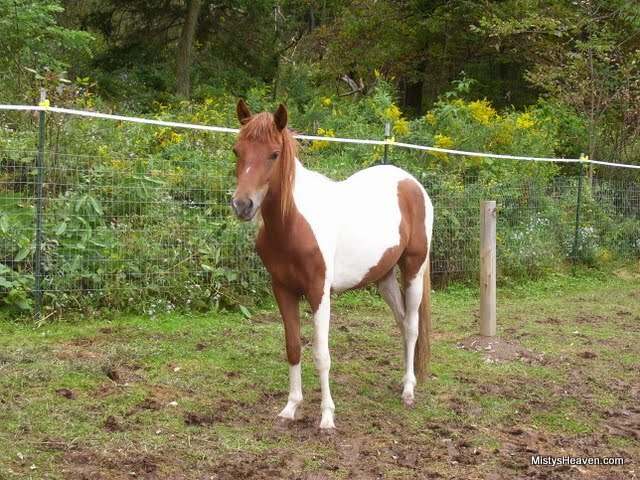 Misty's Cloudbursts is Misty's Desert Sun's first foal and sports her sire's chestnut pinto coloring. She could be seen at the Pony Centre during the summer until she was purchased by Kim Bartlett of Walton, New York in 2006. She is trained to ride, and enjoys time out in the field with her pasture mate, a Shetland pony named Danny Boy. Cloudbursts had her first foal in 2009, a palomino pinto stallion named Misty's Storm sired by Hurricane Charley's Legacy. She had her second foal in 2010, a short lived black pinto filly sired by Island King.